On holiday in the Scottish Highlands, forensic scientist Dr Rhona MacLeod joins a mountain rescue team on Cairngorm summit, where a mysterious plane has crash-landed on the frozen Loch A’an. Added to that, a nearby climbing expedition has left three young people dead, with a fourth still missing. Meanwhile in Glasgow, DS McNab’s raid on the Delta Club produces far more than just a massive haul of cocaine. Questioning one of the underage girls found partying with the city’s elite reveals she was smuggled into Scotland via Norway, and it seems the crashed plane in the Cairngorms may be linked to the club. But before McNab can discover more, the girl is abducted. Joined by Norwegian detective Alvis Olsen, who harbours disturbing theories about how the two cases are connected with his homeland, Rhona searches for the missing link. What she uncovers is a dark underworld populated by ruthless people willing to do anything to ensure the investigation dies in the frozen wasteland of the Cairngorms. 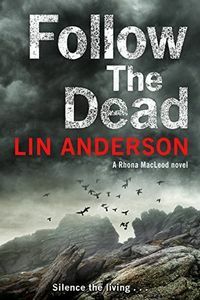 This twelfth instalment in Lin Anderson's long-running series starring Glaswegian forensic specialist Rhona MacLeod is a cracking good read that bleeds Scottish atmosphere and sensibilities. Opening in the Cairngorms mountains near Aviemore in the Highlands, Anderson drops the reader straight into a dangerous situation as a group of climbers trying to enjoy the outdoors as Hogmanay looms. But the group quickly finds itself in grave danger, and not just from the incoming stormy weather. I travelled to Aviemore last year after Bloody Scotland, and hiked around some of the lochs in autumn. I felt that Anderson brings the area to really vivid life in FOLLOW THE DEAD. There's also a great sense of characterisation, from series regulars like McLeod and her police pal DS Michael McNab, to the first-time personalities. There are interesting challenges in both professional and personal relationships, and the character interplay is smooth and assured. It all feels very authentic. McNab in particular rides some fascinating arcs in this tale, both via his working relationship with Norwegian detective Alvis Olsen, who challenges him in various ways, and when he calls on his childhood friend Davey, and a budding relationship with an alluring tattoo artist. Good intentions lead to some tricky situations and unintended consequences. For want of a better phrase, there's just a real solidity to this crime tale: good characters, good plot, great sense of place, some important and interesting issues woven throughout. It's a smooth read that unfolds in an interesting way, taking us from the Highlands to Glasgow to a roiling North Sea. A helicopter crash, mountain murders, and a Glaswegian drugs raid all entwine into a very good crime tale that leads to some even more sinister matters. The addition of the Norwegian component to the investigation adds a fresh touch to an already excellent series, and gives a nod to some of the shared sensibilities of the two 'nord' regions. Well worth a read. Craig Sisterson is a lawyer turned features writer from New Zealand, now living in London. In recent years he’s interviewed hundreds of crime writers and talked about the genre on national radio, top podcasts, and onstage at books festivals on three continents. He has been a judge of the Ned Kelly Awards and the McIlvanney Prize, and is founder of the Ngaio Marsh Awards. You can heckle him on Twitter.